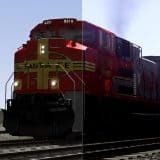 Would you like to get some Train Simulator 2015 Routes Addons? Then you are in the right place! We provide a huge variety of Train Simulator 2015 Routes Mods to our visitors. These extra files are liked in all over the world. Many players hit on Train Simulator 2015 Routes Addons download button daily. Would you like to one of them and improve your score? Then take a look at our Train Simulator 2015 Routes Mods free files and pick the ones you find useful. If you haven’t tried it before, no worries, the process is very simple and won’t cause you any problems. TS 2015 Routes Addons will help you to keep being on track in various situations. Surprise your friends and competitors by completing tasks faster and more efficient. TS 2015 Routes Mods can become your key to success, could you miss it? Surely not! Give it a try right now.